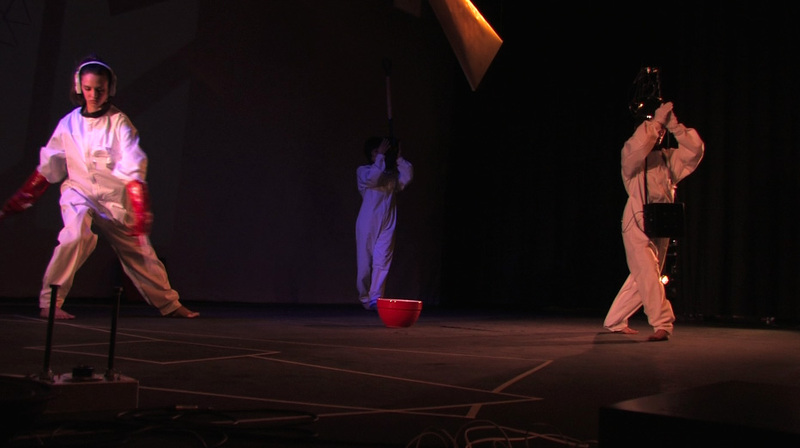 "for the time being" is a "choreosonic performance" created by the DAP-Lab ensemble in 2011-2012, after the completion of their European-Japanese co-production of UKIYO [moveable worlds], a dance installation last shown at Lilian Baylis Theatre/Sadler’s Wells in November 2010. The new work explores the sound of movement in a one-hour stage performance inspired by the Russian Futurist opera "Victory over the Sun" (1913) and its fantastical visual designs (by Malevich and Lissitzky). Nearly a hundred years ago, the Futurists collaborated on an eccentric vision of a society to come, based on revolutionary fervor of the time. But "Victory over the Sun," which may have been an early example of what is now called performance art, is a most curious artefact, based on multidisciplinary collaboration by composer Matiushin, a painter and violinist, the painter Malevich, who later became famous for his abstract Suprematist paintings, the poet Kruchenykh, and poet/mathematician Khlebnikov who had invented a non-sense language called zaum. In a letter to Matiushin, Malevich said, "We have come as far as the rejection of reason because another reason has grown in us which can be called 'beyond reason' and which also has law, construction, and sense ... " It is possible that the sun, which in the opera is captured and eclipsed, is a symbol for reason itself, although it might also be a prophecy of solar or atomic power, "locked up in a concrete house" that seems to have exploded. Matiushin's music was a mysterious aspect of the original piece, since only 27 bars of the original score seemed to have survived. DAP-Lab’s new dance/music theatre work does not try to reconstruct the opera but uses original sound generated live by the performers and sound artists. Inspired by the original opera produced at St Petersburg, El Lissitzky thought that it would also be possible to recast the work as an electromechanical show. He designed a number of figurines and a dynamic stage set for abstract doll-like figures. Besides the "Figurinenmappe," a portfolio of lithographs depicting several of the opera’s characters, Lissitzly drew unique sketches for abstract architectural designs (Prouns) that inspired Michèle Danjoux's costumes and Birringer's scenography. For example, in the first Act, the red and white squares (cf. Lissitzky's The Story of Two Squares), sarcophagus dress (Lissitzky’s Grave Diggers ) and also Tatlin's Tower (radio transmission headwear design), and the yellow triangles are realized as three-dimensional models to be worn, sounded and used as projection surfaces. In his portfolio, Lissitzky provides instructions for anyone who would like to create three-dimensional models based on the illustrations; however, no one has ever done this. 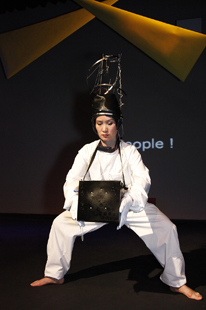 The spatial machinery and costume design in for the time being is part of an on-going DAP performance project that is developed to bring a contemporary sonic arts and dance sensibility to the visionary Russian design art. The DAP-Lab's performance is an intimate temporal work that looks at the fragmented home of our precarious existence in a world full of outworn cliches of revolutions. Featuring four dancers, the work incorporates body-worn-technologies where the structure of the wearable has been developed alongside its interactive and sound generating potential for gestural performance, tuned to basic movement processes of amplification, reduction, distortion, and noise/communication. Interaction design and interface systems enable data to be gathered from the performers’ bodies for affective body-code mapping within this new media artwork with wearables. All the sounds are created live on stage and processed. The artistic premise of the design is to make the activation and presence of sound very visual and sensual to both the performer and the viewer as new compositional and experiential possibilities emerge. An expanded version is now under construction, including further dance and vocal artists, and the new work is available for commissioning at London/UK and European venues in 2013. Assistant video camera: Panos Papafragkos, Carlo Ghidini, Alexandros Papathanasiou.